5S is a systematic approach for organizing and managing the workplace & work flow for improving efficiency and safety by eliminating wastes. 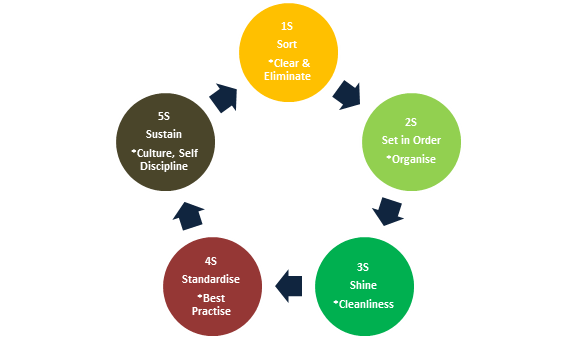 5S is the basic and very important tool for organisation, aiming for highly efficient & motivated work culture. This forms a platform for executing other lean management tools. It may seems easy to implement but a structured approach is very important. We provide training support for practical implementation of 5S in a real environment. We also support real execution at shop floor. Sustainence is very important for any new system to have long term effect. We provide support for routine audits. The training includes utility items/material required for implementation of 5S Consulting Services program. Utilities required for implementation will be provided free of cost. Any set-up of manufacturing, repair, servicing, with small to large workspace, with a zeal to improve should partner. Engineers, Managers, or any other person looking For efficiency improvement in office should also contact us.